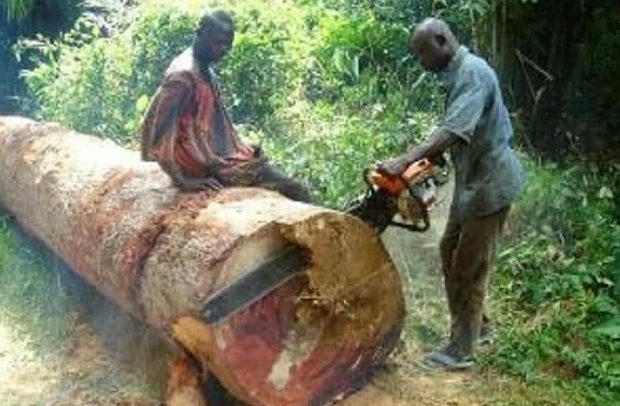 THE POLICE at Nkrankwanta in the Dormaa West District of the Brong Ahafo Region have impounded two trucks loaded with ‘illegal’ chainsaw lumber belonging to a company. As a result, the Dormaa Municipal Forest Service Division has requested the police at Nkrankwanta to release the vehicles and their contents to the service for further action to be taken against the said company – Fosu and Fosuaa. The vehicles were impounded by the police at Nkrankwanta on 23 August, 2018, at about 2pm. Later, investigations proved that a permit was signed by the Executive Director of Forest Service Division in Sunyani, Oppong Sasu, with a copy to the Dormaa Service Division to the effect that the company was to salvage trees in the Monshiekrom and Kookumikrom reserves. Thorough inspection of the permit by the Dormaa Forest Service Division in conjunction with the police rather found out that the company is to salvage trees within a permitted area of operation. Chainsaw machines are not allowed to be used to saw trees in the permitted area. Therefore, the Assistant Manager of Forest Division at Dormaa, Emmanuel Owusu, has requested the police at Nkrankwanta to release the vehicles and its contents to the service for further punitive actions against the company since ‘the act of the permit holder’ contravenes the forest protection law of the country. Police say investigations continue into the conduct of the company. Regional Police Spokesman, Chief Inspector Kinsley Augustine Oppong, confirmed this to DAILY GUIDE in an interview on the phone.